The G2 Vision Jet’s Garmin avionics suite is upgraded to the Perspective+ configuration, with faster processors and higher-resolution displays, Flight Stream 510 wireless gateway, and a Garmin autothrottle system for the Fadec Williams International FJ33-5A turbofan. Its Flight Stream 510 facilitates Garmin Connext flight plan transfers, database updates via the Garmin Pilot app, and text messaging using Garmin Pilot and the Garmin GSR 56 Iridium satcom. The SiriusXM radio system can also now be controlled by a cellphone instead of through the avionics. The autothrottle is among the updates in the Cirrus G2 Vision Jet. Its autothrottle simplifies single-pilot flying by maintaining a manually set or FMS programmed airspeed. The system automatically lowers the power setting and adjusts speed if the jet is flying too fast—for example, preventing exceedance of speed restrictions in the terminal environment. The autothrottle can be used after 400 feet agl on takeoff and during an instrument approach to minimums. During a coupled instrument approach, the autothrottle and autopilot can automatically fly the missed approach procedure. In addition, the autothrottle brings new functionality to the Garmin Electronic Stability & Protection System (ESP) on the G2 Vision. For example, in a stall, the autothrottle adds power to complement the autopilot lowering the nose, even if the autothrottle and autopilot are not engaged. Using the emergency descent mode, the autothrottle lowers power to a setting optimal for the descent but also for leveling off at a safe airspeed (about 82 percent power). The FJ33-5A engine has also been modified with a new thrust schedule from FL240 to FL310, the new maximum operating altitude (up from FL280), giving the G2 Vision an improved climb and a seven-knot increase in cruise speed at FL280 to 311 ktas. At FL310, the Vision G2 can cruise at 305 ktas, one knot faster than the original Vision at FL280 (at ISA and mtow). Range is about 100 nm higher at long-range cruise of 240 ktas, giving a range of more than 1,200 nm, or G2 pilots can carry more payload when flying at the more typical maximum continuous thrust power setting. On an 800-nm mission, an additional 150 pounds of payload is possible, and for a 1,000-nm mission, another 170 pounds of payload can be carried. The Beringer wheels, which were finished with a red anodized coating, are now a more subtle gray color, which doesn’t clash with the paint job. Two True Blue Power 17 amp-hour TB17 lithium-ion batteries replace the original lead-acid batteries, adding to the weight savings (about 45 percent lighter) and providing a faster, cooler engine start, especially in cold weather. The TB17 batteries eliminate a cold temperature limit for battery starts on the original Vision as they are equipped with internal heaters. Another improvement with the new batteries is that they don’t require removal for recharging if depleted, as do the lead-acid batteries. Cabin improvements include new executive seats in the center to accommodate owners who fly with the rearmost three seats removed. The new seats are wider and have added bolstering and they bracket a new center console with storage space in the middle and stowaway tray tables on the edges for each occupant. The center console is easily removable and fits into the baggage compartment. New carpeting is more robust and improves the interior appearance. The mid-2018 addition of a 22-inch fold-down monitor for rear-seat occupants carries through in the G2 Vision. 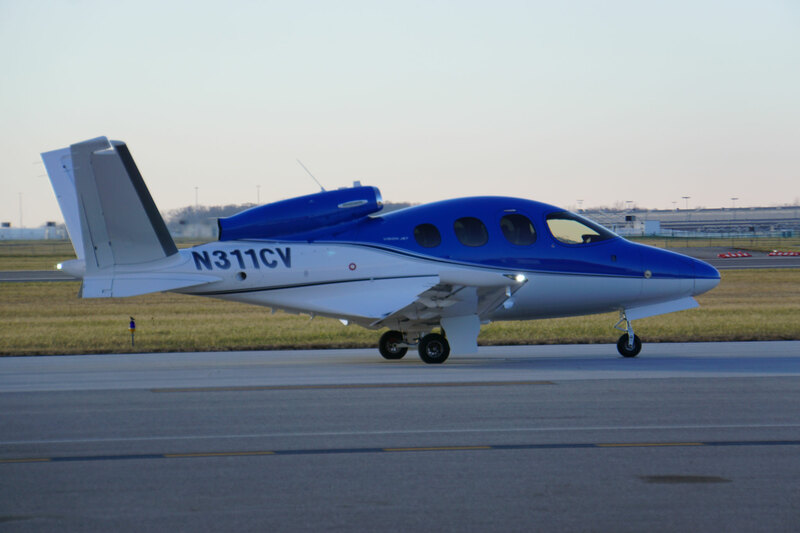 Recognizing that many operators remove the rearmost three seats, Cirrus outfitted the Vision Jet G2 with larger center executive seats and a removable console. Meanwhile, the pressurization system and cabin structure were modified to allow for a maximum differential of 7.1, up from 6.4, delivering an 8,000-foot cabin at FL310. At FL280, the G2 Vision provides a lower cabin altitude of 6,400 feet. Passenger oxygen masks are now automatically deployable. With the new maximum operating altitude of FL310, the G2 Vision is now RVSM capable from the factory. Cirrus is offering a training program to help buyers meet RVSM requirements and will also help them submit a letter of authorization application. Today’s G2 Vision base price is $2.38 million, with the fully loaded Elite configuration at $2.75 million. About three quarters of buyers of the Vision jet are upgrading from a Cirrus SR series single-engine piston, with the rest coming from high-performance single-engine pistons and turboprops as well as light jets, according to Matt Bergwall, Cirrus’s director of the Vision Jet product line. Pilot training for a Vision Jet type rating begins six months before delivery, starting with Cirrus’s online training program. A type rating is required because the jet is powered by a turbine engine. “The foundation for the type rating is IFR skills,” he said. Generally, recently licensed IFR pilots have an easier time in the type rating course because they are more familiar with modern avionics and procedures. Vision pilots also need to learn about minimum equipment lists and now, with the G2 Vision, RVSM operations. Fortunately, an FAA letter of authorization is no longer needed for RVSM in the U.S. for aircraft that are ADS-B Out-equipped like the Vision Jet. Cirrus’s Knoxville, Tennessee campus includes a Part 142 training organization, and this is where all Vision Jet training is done in a CAE Level C full-flight simulator (which will soon be certified to Level D). Type rating training includes two Cirrus Airframe Parachute System (CAPS) deployments, and this also has to be demonstrated during the checkride. Studying the online training before the type rating course will help new Vision pilots get up to speed quicker, plus they can come to Knoxville beforehand for a course on the jet’s Perspective avionics. At Knoxville, the training center also has cockpit procedures trainers replicating the Perspective system for each Cirrus model (two SR and one Vision Jet) as well as two Vision Jet and one SR flight training device that students can practice on. Pilots who are new to turbofan flying also need to fly 25 hours of supervised operating experience with a mentor pilot after getting their Vision type rating. But even professional pilots with turbine experience can benefit from some mentoring, Bergwall said. The type rating course lasts 10 days, and annual recurrent training takes two to three days. The preferred timeline is for pilots to get type rated about a month before the delivery of their new jet, which separates the stress of the checkride from the delivery experience. “It should be an exciting time,” he said. This was my second time flying the Vision Jet, and it felt just as comfortable as the first time. Sitting in the roomy Vision feels a lot like a Cirrus SR, with many similar ergonomic features to make an SR pilot feel at home and simplify the transition to the jet. The big difference between the Vision and an SR is the three Garmin GTC 580 touchscreen controllers mounted in landscape orientation below the PFD and MFD, a big upgrade from the keyboard-based Perspective suite in modern SRs. One of the controllers doubles as a backump display, so there is no need for a separate space-hogging backup unit. The new Garmin displays operate much faster and have sharper graphics, and I was able to read small print without having to zoom in. The sidestick (not a side-yoke like the SR flight control) falls readily to hand, as do the touchscreen controllers, throttle quadrant, and other controls. Many operators of the Vision Jet step up from the Cirrus SR20/22, and one change they can expect is the sidestick in place of the side yoke. After starting the engine, we flight-planned a route from Knoxville to Dayton, Ohio, via Huntington, West Virginia, where we planned an autopilot- and autothrottle-flown missed approach. For pilots already used to the Garmin avionics environment in an SR, the touchscreens in the Vision are even easier to use. The touchscreens are infrared-based, so pilots can wear ordinary gloves or even use a pencil eraser or other thin blunt item to work the screens. We were limited to FL280 because of some FAA Flight Standardization Board paperwork that was pending, but I would be able to see the G2 Vision’s improved efficiency at that altitude, even if we couldn’t climb to the new FL310 maximum operating altitude. Taxiing the Vision is just the same as an SR, with differential braking for steering. Winds were calm as I lined up with Knoxville’s Runway 23L and pushed the power lever to the stop; the Williams International FJ33-5A’s Fadec automatically sets maximum power. Bergwall and I had briefed the takeoff and the 1,000-foot-agl minimum height needed for deployment of the CAPS. Checklists are all electronic and controlled using a wheel/button just below the MFD. The Vision Jet’s controls are crisp and positive, and I like the feel of the sidestick. Rotation came quickly; I lifted the nose and, as we began climbing, reached up to retract the landing gear, then flaps. At 400 feet, I engaged the autopilot and autothrottle, and the latter soon pulled power back to maximum continuous (MCT) and maintained speed at our selected 155 kias with flight level change (FLC) selected on the autopilot. Passing through 15,000 feet, climb rate was 1,500 fpm, then at FL240 1,000 fpm. We leveled at FL270 briefly, and cabin altitude was 5,850 feet. After climbing to FL280, the autothrottle kept power set at MCT and speed settled at 300 ktas and fuel flow 62 gph with temperature at ISA +10 deg C. Bergwall said that at FL310, fuel flow would be in the high 50s (gph). I like the Vision’s percent thrust display because it’s easy to set power compared with referring to the engine instruments. The autothrottle works with Garmin’s Electronic Stability and Protection system to keep the Vision from going too fast at one end, or stalling at the other. As we descended toward Huntington in vertical speed mode, the autothrottle pulled the power back to keep the speed below the redline. Bergwall demonstrated setting up a VNAV descent with a target altitude of 3,200 feet and 189 Kias at the [use small caps for this] KOSME initial approach fix, and the autothrottle did a perfect job of slowing us down, first to below 250 kias before reaching 10,000 feet then to the target airspeed and altitude at KOSME. The autothrottle is an excellent helper for single pilots. I selected flaps 50 (percent) then lowered the landing gear as we lined up with the final approach course for the RNAV 30 approach. The autopilot and autothrottle tracked the vertical path perfectly smoothly. I lowered flaps to full as we continued descending, then at decision altitude I pushed the TO/GA button on the power lever and the autothrottle pushed the power to takeoff while the autopilot raised the nose to seven degrees for the missed approach. I set flaps 50 then raised the landing gear and retracted the flaps fully while the autopilot/autothrottle began following the missed approach procedure. For the leg to Dayton, we climbed to FL180, where speed was 294 ktas and fuel flow somewhat higher at 81 gph. I tried the manual setting on the autothrottle, which is helpful when flying ATC-assigned speeds instead of according to the FMS flight plan or schedule. In manual mode, I could select speed with a wheel mounted near the autothrottle, which is also the location of the on/off switch and manual/FMS buttons. The weather was clear and calm at Dayton as I hand-flew the ILS approach to runway 24L. I came in a little low as we neared the runway, but the Williams engine responded quickly to my power input. Landing the Vision is a lot like an SR, but the avionics automatically calculates Vref based on actual weight. In this case, at about 5,000 pounds, Vref was a low 81 knots. The Vision feels less like a jet during touchdown, and just like an SR, I flew it down to the runway with a little speed above Vref to provide some extra energy then pulled the nose up slightly for a smooth touchdown on the mains and moderate braking to make the next taxiway. As of early January, Cirrus had delivered 88 Vision Jets, and this year plans call for building at least another 80, with a production rate of six to seven per month. The backlog is 540 jets, but prospective buyers don’t have to wait years to get one, Bergwall said, as some earlier slots are usually available. Cirrus can also increase the production rate if the market demands faster deliveries.